I grew up near San Luis Obispo, an idyllic town on the Central Coast of California. The rugged Pacific coastline, dark sapphire waves and golden hills provided me a bountiful natural playground. I spent countless childhood weekends hunting for seashells, fishing for sanddabs and exploring the tide pools. Growing up surrounded by natural beauty was a privilege, one I appreciate all the more now that I’m living in the noise and traffic jams of Los Angeles. Every so often, I feel the need to return to my roots… to the open spaces and bracing ocean breeze of the Central Coast. In the summer of 2012 I did just that, taking a road trip up the coast of California. My first stop was Hearst Castle, the historical ranch home of William Randolph Hearst. Nestled in the hills above Highway One, 42 miles north of San Luis Obispo and 94 miles south of Monterey, this magnificent estate was Hearst’s dream home, an unfinished 28-year construction project that now stands as a state historic park and museum. Today, the castle receives roughly 1 million visitors per year. 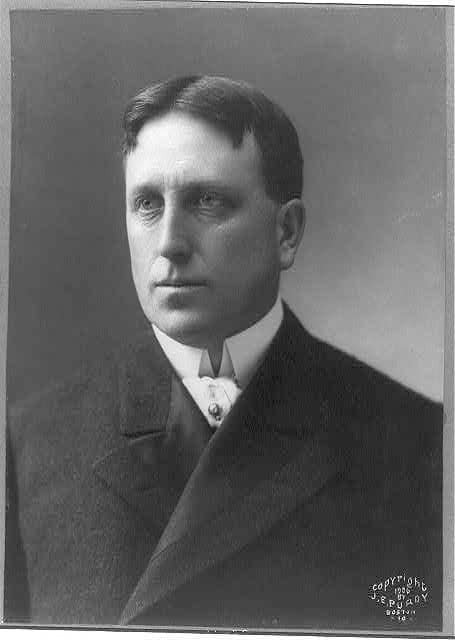 William Randolph Hearst was a wealthy and powerful newspaper publisher who changed the face of American journalism. Born in San Francisco in 1863, Hearst first gained prominence when he took over the San Francisco Examiner newspaper from his father in 1887. Hearst employed some of the best journalists in America and used new tactics to help his paper gain a massive readership. In 1895 Hearst acquired another paper, the New York Journal, putting him in direct competition with rival newspaper proprietor Joseph Pulitzer. His success with the Journal helped him to acquire 28 additional newspapers and magazines, as well as radio stations and movie companies, making him one of the wealthiest men in the world. Hearst lived a colorful, often controversial life. For several years he dabbled in politics; in 1906 he ran for governor of New York, narrowly losing to opponent Charles E. Hughes. After giving up his political ambitions, Hearst embarked on a long-standing extramarital affair with actress Marion Davies. Orson Welles’ film Citizen Kane is very loosely based on Hearst’s life story. Over two decades after Hearst’s death, his granddaughter Patty Hearst gained notoriety after being kidnapped by a violent revolutionary fringe group known as the Symbionese Liberation Army. In a likely case of Stockholm Syndrome, Patty sympathized with her kidnappers and helped them to rob a bank, after which she was arrested and jailed (she was later pardoned). Even now, more than 60 years after his death, Hearst’s life and achievements continue to fascinate. 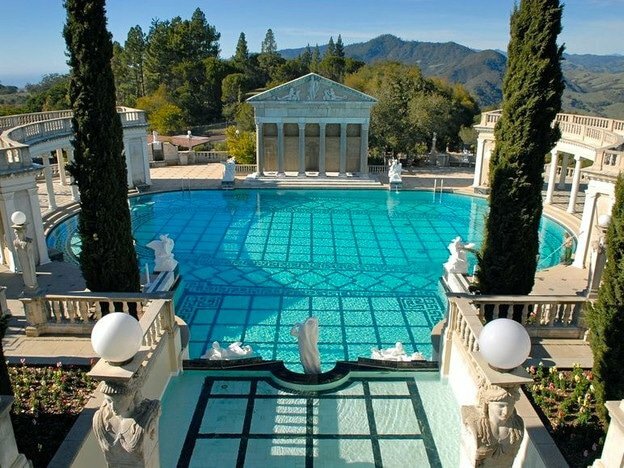 Nowhere is his impressive legacy more evident than at Hearst Castle, the most beloved project of the newspaper magnate’s life. Hearst Castle stands on 250,000 acres of coastal ranchland that William Randolph Hearst inherited from his father, George Hearst, a wealthy silver and gold miner. The ranch site was originally 48,000 acres; William later acquired over 200,000 more. Originally known as “Camp Hill,” the land served as a rustic ranch. Hearst traveled there frequently to escape the city; his family and friends would camp there in elaborate tents. Over time, Hearst desired a more permanent residence, a place where he could entertain his world-famous guests in style. The front entryway to the main residence. In 1919 Hearst enlisted the help of Julia Morgan, a famed San Francisco architect, to design the estate. For the home site, Hearst chose a rocky perch with a view for miles. He named the site “La Cuesta Encantada” – The Enchanted Hill. Working together, Hearst and Morgan spent 28 years designing Hearst Castle. By 1947, they had created an estate of 165 rooms and 127 acres of gardens, terraces, pools and walkways. In its heyday, the Castle played host to world famous celebrities, intellectuals, politicians and luminaries. Numerous Hollywood stars enjoyed the estate, including Charlie Chaplin, Greta Garbo, Clark Gable, Mary Pickford, Douglas Fairbanks Jr., Joan Crawford, Gary Cooper, Louis B. Mayer, Lionel and John Barrymore, Jean Harlow, Buster Keaton, Erroll Flynn, Carole Lombard, Barbara Stanwyck and Cary Grant. Other notable visitors included Winston Churchill, Calvin Coolidge, George Bernard Shaw, Charles Lindbergh and Howard Hughes. As a child I visited the Castle a few times with my grandparents and on elementary school field trips. On my most recent visit, I took the Grand Rooms tour, which gave me a glimpse of the main social rooms in the residence. Of particular interest to me, of course, was the Dining Room. Today it is known as the “Refectory,” the term for a monastery dining hall. If this room looks familiar to you, it may be because you’ve seen the Harry Potter films. The dining hall set at Hogwarts Academy was modeled after it. 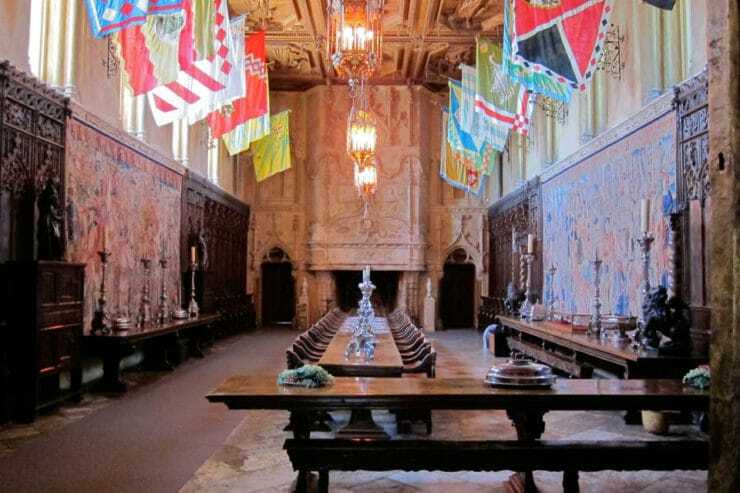 The Hearst Castle Refectory is very grand, large in scale and filled with rare museum-quality furnishings. The room measures 67 feet long and 27 feet wide. The walls rise 27 feet to an ornate carved wooden ceiling, which originally belonged to a 16th century monastery in northern Italy. The walls of the room are lined with Gothic Flemish tapestries and paneled with 15th century choir stalls from a Cathedral in Spain. Silken Italian flags known as Ward banners, some over 400 years old, hang between the French Gothic windows. An enormous French Gothic fireplace gapes at the end of the room, the largest of 38 fireplaces in the Castle. The dining tables are monastic refectory tables. Pieces of Hearst’s large antique silver collection can be seen throughout the room. Despite its valuable antique tapestries and museum-like decor, the food served at Hearst Castle was somewhat rustic. Hearst had always envisioned the castle as his “ranch residence,” which meant that the meals were comprised of fine quality comfort-style foods. Food was served on Real Old Willow English China. 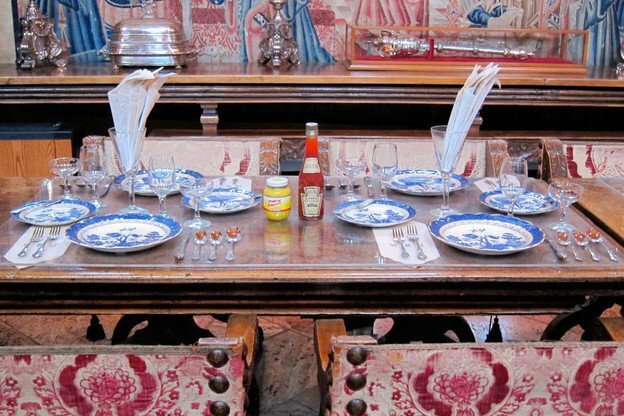 Casual silverware and paper napkins were used, even though the room itself was filled with fine antique silver. As you can see by the menu, meals served at the Castle were generally far more relaxed and “ranch-style” than their refined surroundings. After touring the main residence, we walked around the gorgeous gardens and explored the grounds. The place is teeming with colorful flowers, lovely trees, and ancient marble statues and artifacts. I could have stayed there for hours, languidly relaxing in the shade and smelling the fresh flowers and ocean breeze. Alas, we had to move on– we had a long drive ahead of us. On our way back to the buses, which shuttle guests up and down the winding driveway to the Castle, we were treated to a glimpse of the gorgeous indoor Roman Pool. 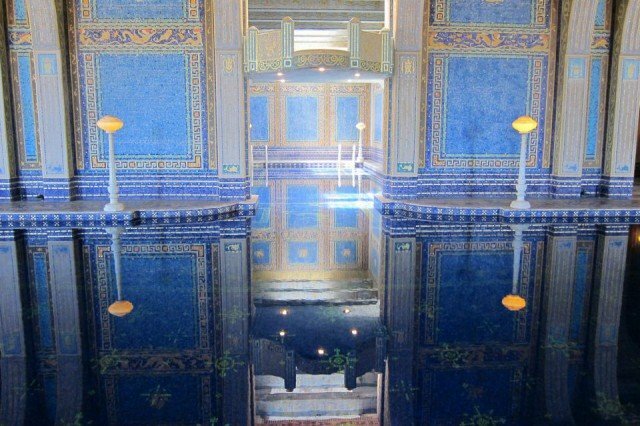 The pool is decorated floor to ceiling with intricate blue tiled mosaic patterns. The pool is styled after ancient Roman baths; the mosaics are inspired by the 5th Century Mausoleum of Galla Placidia in Ravenna, Italy. My sixth grade teacher Mr. Smith was a part time tour guide at the Castle. I remember him telling our class that once a year, the Castle shuts down early and allows all of the employees to have a holiday party in the Roman Pool. How cool is that?! 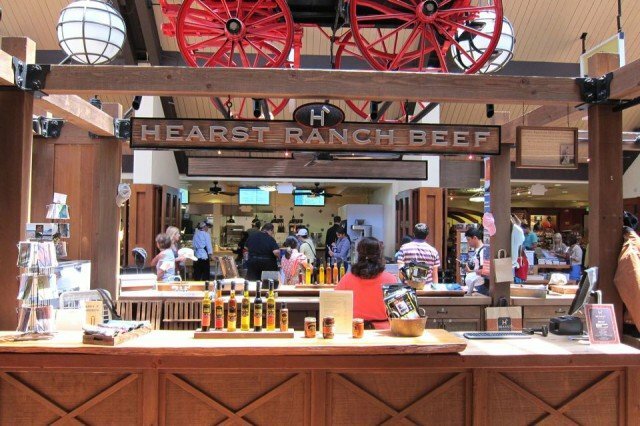 On the way out, we passed by the Hearst Ranch Beef stand. The 250,000 acres surrounding the castle are now home to a large herd of free range cattle. The high quality, grass-fed and grass-finished meat can now be purchased in Whole Foods across the country. You can also buy it online at the Hearst Ranch website. 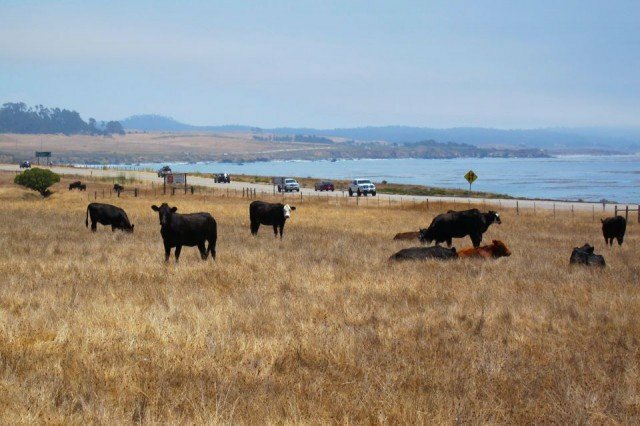 Here are some Hearst Ranch cattle we saw on the way out. Check out the view they have each day– not too shabby! Lunch would be about 1:30 p.m., dinner about 8:30 or 9:00 p.m., followed by a movie, and if the night would run, as it frequently did, for an hour or so later, the chances were better that even he would be in the kitchen either grabbing a snack of cold meat and cheese for himself, or making a Welsh rarebit for all comers. The latter dish he made with pride and some beer, but whatever the recipe, I know it was a favorite of all those who were fortunate enough to partake of it. For all I know he might, in some quarters, have been considered a gourmet. Certainly he knew, appreciated, served and ate good food. The cookbook contains Hearst’s own recipe for Welsh Rarebit, as recalled by the Hearst Castle kitchen staff. 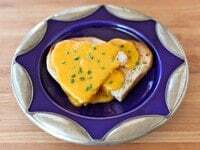 Though it may sound like an old-fashioned dish made of rabbit, Welsh Rarebit (sometimes called Welsh Rabbit) is actually a simple dish made from toast and melted cheese. For Hearst’s version of this dish, the cheese and butter would have been procured from the castle’s on-site dairy. The bread would have been baked fresh on site. In fact, most foods at the castle were grown and made there. Fruits and nuts were picked from the orchards, fresh vegetables were grown and raised nearby, and beef and poultry were raised and butchered at the ranch. Dry ingredients and pantry items, like flour and Worcestershire sauce, were purchased in bulk. 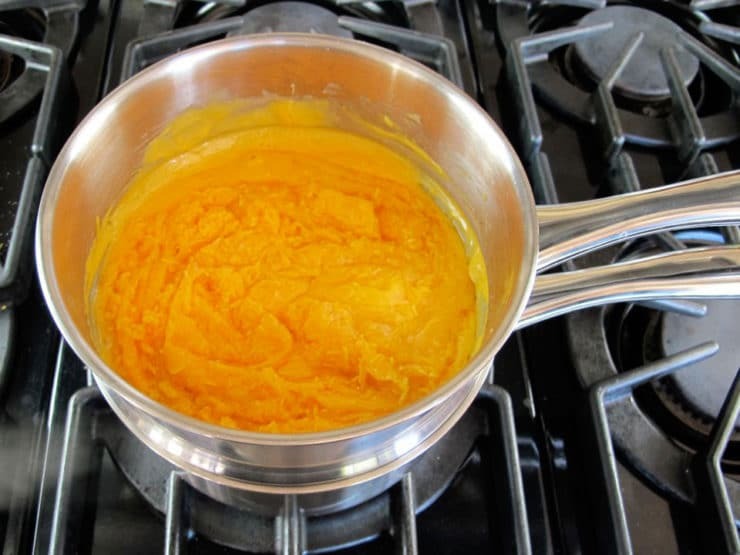 As I made Hearst’s Welsh Rarebit at home, I began to daydream about the castle. I imagined myself in the grand kitchen, together with a cast of Hollywood legends, watching Hearst make us a late night snack. What a fun way to taste the history of La Cuesta Encantada. If you’re interested in visiting Hearst Castle, be sure to make reservations through the Hearst Castle website. The tours can fill up in advance, especially during the popular summer months, so plan ahead. It’s a journey well worth making– touring the Castle feels like taking a step back in time. 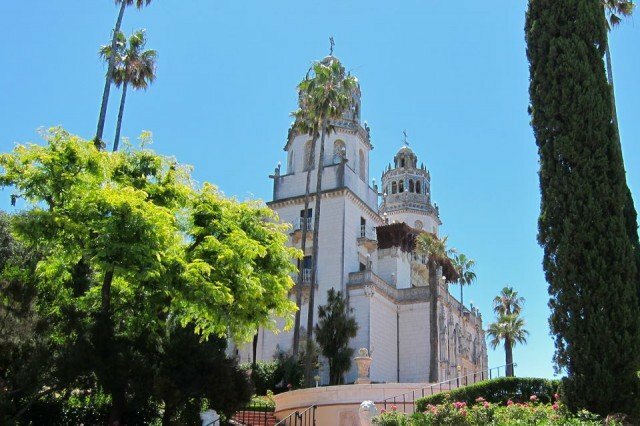 Learn about the culinary history and food of Hearst Castle, the William Randolph Hearst estate. Includes Hearst's recipe for Welsh Rarebit. 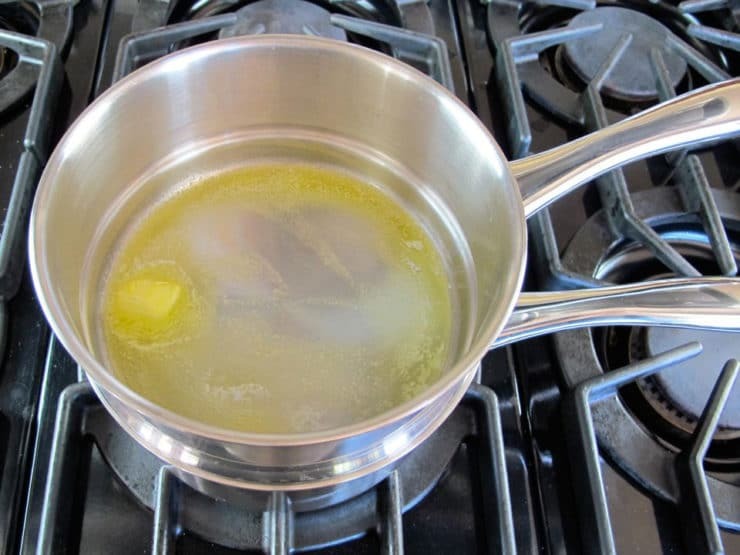 In a chafing dish or large double boiler placed over simmering water, melt the butter. 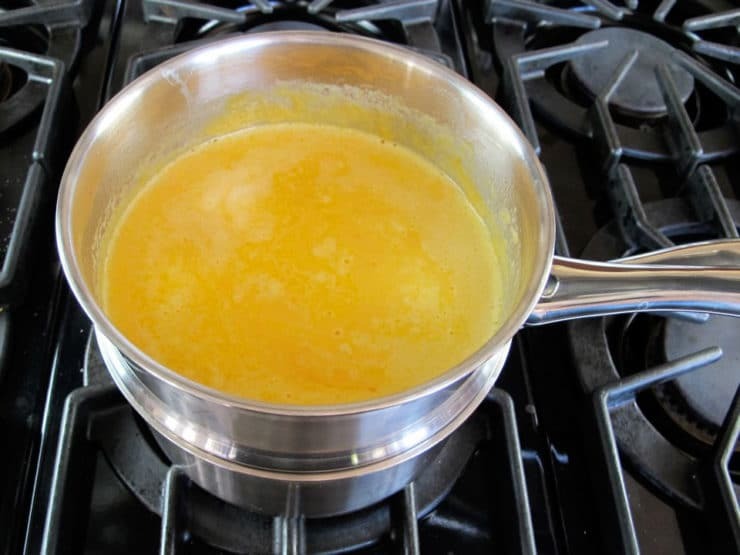 Add the grated cheese and stir until it begins to melt. Slowly add the beer, stirring. I used Sierra Nevada beer as a nod to George Hearst's gold and silver mining past, but you can use any beer you like. 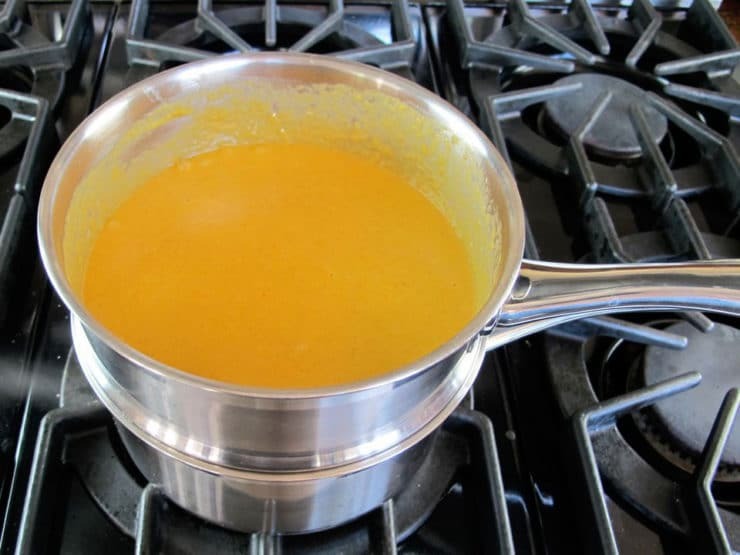 Serve cheese sauce immediately over crackers or toast. I used sourdough toast in honor of Hearst's San Francisco roots (crusty French bread would be lovely, too). I garnished the dish with some fresh chives, a tip I picked up from my friend The Pioneer Woman. The garnish is not in the original Hearst recipe, but it adds a nice flavor and color to the finished product. Collord, Marjorie (1985). The Enchanted Hill Cookbook: The favorite recipes of William Randolph Hearst. Blake Printing & Publishing, San Luis Obispo, CA. 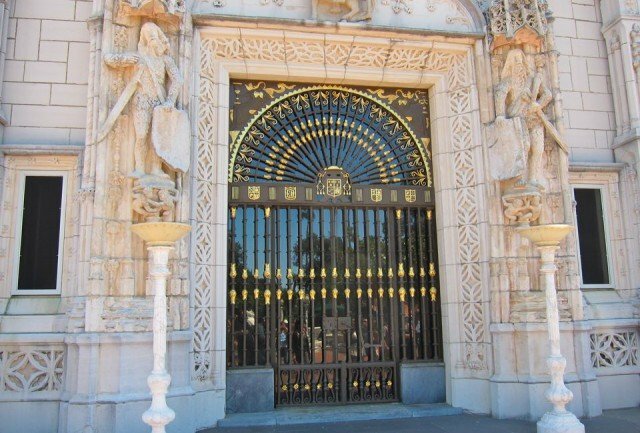 “Historic People.” Hearst Castle History and Art. Hearst Castle California State Park, n.d. Web. 04 Aug. 2012. Nasaw, David (2000). The Chief: The Life of William Randolph Hearst. Houghton Mifflin Company, New York, NY. My uncle was a summer guide at Hearst Castle when I was a kid. Great memories. I love Hearst Castle! Went there on a road trip several years ago with my girlfriends. I would love to swim in that pool. I love Hearst Castle (and the whole Central California coast, where I’ve vacationed with my family). I love that plate in the last picture (where did you get it?)! Aww, thanks Stella! The plate is from a Moroccan store here in Los Angeles called Mosaik. Super cool place with lots of one-of-a-kind items. Thank you Carolyn! For some reason the egg is not listed in Hearst’s original recipe, though it is included in the cooking instructions. I’ve added it to the ingredient list.